Hollywood screenwriting is a big business. It’s practically a law that anyone with opposable thumbs who lives in Southern California write a screenplay, lured in by the knowledge that even uncommissioned spec scripts used to make between six and seven figures just a few short years ago. With so many people chasing the dream, it was only natural that another cottage industry sprung up alongside it: one filled with screenwriting “gurus." John Truby, Syd Field, Lew Hunter, Robert McKee – all guys who have written books and hosted seminars designed to show aspiring Shane Black wannabes how to craft their story so studio bosses (or, more accurately, lowly secretaries and freelance readers) get excited about the project and pass it up the line. The ideas behind story structure aren’t new – Aristotle wrote Poetics in 335 B.C., a few years before the first multiplex sprung up – but the past few decades have seen a rise in the number of books and software designed to help writers crack their tales. For years, Field’s Screenplay was arguably the most influential – espousing the benefits of a three-act structure with generalized advice about where one act ends and another starts. For years, you could basically chart movies with your watch and a pad of paper, picking out the plot points where acts transitioned and inciting incidents according to Field’s paradigm. Countless other books tweaked the formula – and it was a formula, giving things new names or occasionally arguing for a five-act structure instead of three – but the recipe was mostly generalized. That meant there was at least some room for deviation and creativity on the writer’s part. 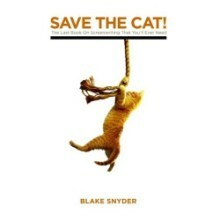 That all changed in 2005, when screenwriter Blake Snyder wrote a book called Save the Cat: The Last Book on Screenwriting You’ll Ever Need. The book showcased Snyder’s variation on the three-act structure. Unlike Field and his contemporaries, Snyder got intricately detailed when it came to what should happen when. In essence, he created a screenwriting formula based on watching hundreds of Hollywood films and breaking down their beats by the minute they occur and genre, and then replicating it in different stories. When I read the book back in 2006, it was eye-opening. Snyder really did his homework and an aspiring writer could follow his instructions and come out with a fairly serviceable script, which is exactly what many spec writers and studio hires have been doing for the past six or seven years. A recent article posted over at Slate examines just how prevalent Snyder’s (who passed away in 2009) method has become. If you’ve watched some of Hollywood’s biggest blockbusters over the past few years and felt you were seeing the same basic stories with different characters, you weren’t really imagining things; that’s just Snyder’s influence on the studio system and the writers working in it. While very little of what Snyder came up with was entirely original (there are lots of nods to Poetics, Field’s work, and Joseph Campbell’s The Hero with a Thousand Faces in Save the Cat's system), that’s almost fitting since so many of the films written using his technique don’t seem particularly original either. Don’t just take my word for it, though. Peter Suderman over at Slate breaks it all down far more effectively than I ever could. And to be fair, I don’t think any of this as meant as a dig at Snyder. The author didn’t do anything other writers hadn’t been doing for years – studying stories to find their DNA and structure to make his own work better – and the way he breaks down popular films is interesting even if you’re not a screenwriter wannabe and just someone who loves film. If you want to blame anyone for the seemingly endless stream of movies following his system to the letter, blame Hollywood (which loves a sure thing that’s worked in the past) and writers (who are always looking for a shortcut that makes the process of writing a little easier and more manageable). Really, though, don’t even blame them – because as previous screenwriting crazes have demonstrated, this one too shall pass.